I have a soft spot in my heart for home offices that are in unexpected places — inside closets or armoires or lofted above a living room. This week’s office caught my attention because it is in that strange area next to, and under, a staircase. In some homes there might be a closet or a window in this space, but I really like how this homeowner has constructed it to be a nice office. 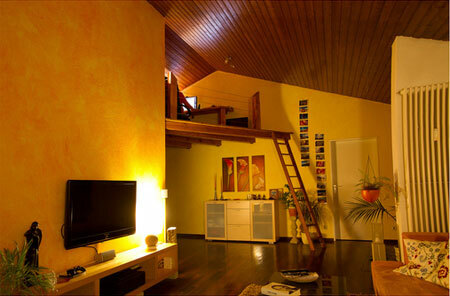 I especially like the vertical storage — running completely up to the ceiling. And, to the right of the desk, cut into the wall immediately under the stairs, is a set of five shelves that hold her printer and other office objects. 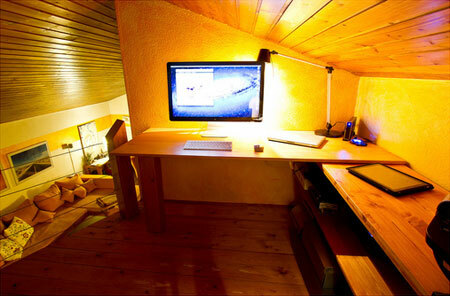 Thank you, Jennifer, for submitting your lovely desk to our Flickr pool. According to the National Association of Professional Organizers, the phrase “get organized” is one of the top 10 resolutions people make every year. I’m not really sure how to validate this information, but my guess is that some version of “get organized” falls on the majority of resolution lists (“get the basement organized” or “have better time management”). 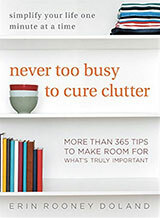 If you add uncluttering into the “get organized” category, it’s likely a top 5 resolution. If you fall into the group of resolution makers who wants to be better organized in 2012, the first thing to do is specifically identify why you want to be organized. Being organized isn’t usually a goal. Being organized is merely a path to achieving another goal. For instance, you might want to be better organized with your time after work so you finally get your business idea off the ground. You might want to be more organized with meal planning so you have less stress surrounding mealtimes with your family. Knowing why you want to be organized will help you with the remaining steps of the resolution-making process and with ultimately achieving your goals. While brainstorming resolutions and the reasons you wish to make your resolutions, keep in mind that change is difficult and that research has found that it is easiest to achieve a goal when you’re only focusing on one at a time. This means you need to have 12 or fewer personal resolutions for 2012, giving yourself at least one month to focus on each resolution. If you have a resolution such as weight loss, and you want to be better organized with your meal planning to help you achieve that resolution, consider making your weight-loss resolution a six month or even an entire year-long resolution. You can focus on each step to help you achieve the weight loss each month — research and doctor’s visit in January, journaling food consumed and daily weight in February, meal planning in March, twice-a-week workouts with a personal trainer in April, four-times-a-week workouts on your own in May, etc. After you have identified why you want to be more organized and have a rough idea of the resolutions you wish to achieve, your next step is to create a detailed plan of action. This Resolution Action Plan should include very specific language and planning. You need to identify exactly what you want to do in concrete terms and then the exact steps of how you plan to achieve these steps. Create milestones — small goals — for each resolution and rewards you will give to yourself when you reach each milestone. Similar to last year, I will be taking on 12 monthly resolutions in 2012. Some of the resolutions are organizing and uncluttering related, but most are personal in nature, so I won’t be writing about them the way I did in 2011. I will check in with you over the course of the year, however, to see how you are doing with your resolutions and to provide tips for making and keeping your 2012 Resolution Action Plan. What resolutions do you have on your Plan for 2012? Good luck, and I wish you great resolution success in the coming year. It’s definitely NOT a unitasker. Nope. You could easily also use it on a … a … a … lime? Sure, okay, a lime! A kiwi AND a lime! It’s a multitasker! 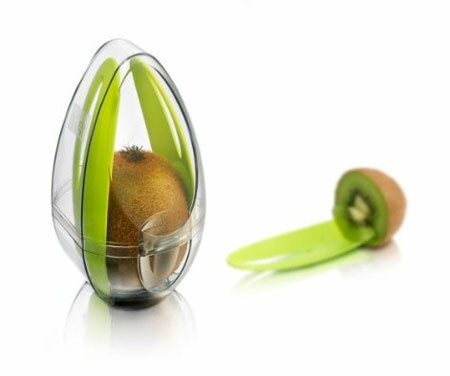 Thanks to reader Anis for finding us this incredibly specific device to protect a single kiwi. Keep perspective. If the present doesn’t arrive until after the holidays, the ornaments aren’t hung on the tree, or the gravy never makes it on the table — you will be okay. In fact, you’ll probably have a funny story to tell for years to come about the year you didn’t serve ham because it was frozen solid and Uncle Jerry broke his knife trying to cut it. Adopt a mantra. I’m not really one for mantras (especially after watching Annie Hall: “I forgot my mantra!”), but this time of year I’m willing to give any stress-reduction method a try. I like to repeat, “What is really important?” It helps to keep me focused on what matters instead of what doesn’t. Whatever positive saying works for you, use it. Often. Let it go. You are not a superhero. Perfection is unattainable. Buy a smoked turkey if you’re nervous about cooking the bird. Throw all your clutter into a closet and deal with it after the holidays when you’re more level-headed. Purchase a gift card instead of hunting for the exact gift you think you might discover at the last minute. A happy holiday celebrant is much more enjoyable to be around than someone who is miserable and curt with everyone around him. Happy holidays from all of us at Unclutterer! We wish you and yours a stress-free and joyful season. P.S. Check out our 2011 Unclutterer Holiday Gift Giving Guide for ideas if you still have shopping to do. There are many gifts on these lists you can get online and never have to set foot in a store. November’s resolution was to take one complete day off from work. Until November, I had not taken a full day away from work since August 2008. It wasn’t that I had put in an eight hour workday every day since August 2008, but that I had done at least some kind of work every day — respond to Unclutterer email, delete spam comments from the Forums, check in with a client, make a few edits to my writing. Working for a lifestyle business has many advantages — I can work from anywhere, have flexible hours if necessary, I was home to witness my son’s first steps and hear his first words, and I’m able to be home to take care of him when he’s sick. Additionally, I get to write and help people and do work that I genuinely love. My work and my personal life are deeply connected, and I like it that way. The one disadvantage of having a lifestyle business is that if I shut off from work, I directly feel any and all negative repercussions. The most obvious of these are the financial repercussions that can impact my family’s well being (e.g. if I don’t answer a call from a client, the client fires me and hires someone else). Every job has disadvantages, and thankfully the advantages of my job far outweigh the disadvantages, it’s simply difficult to walk away for an entire day. I eventually was successful at taking a day off from work, but I have to be honest and admit that it wasn’t my intention to take that specific day. I accidentally didn’t charge my cell phone while on vacation and so I was forced to take the day off from work. I also spent the entire day fretting and stressing out about not doing the work I had planned. Had it been done on the day I had planned, I think I would have enjoyed it more than the way it happened. It is fair to say that although I technically completed my November resolution, the resolution was not a pleasant success. Or, more precisely, I realized I made a resolution I didn’t enjoy achieving. I discerned from this experience that I am a person who is okay with doing a little work every day. This may change in the future and I may grow to be someone who wants more time being disconnected, but right now I’m not that person. I enjoy the peace of mind I get from checking in for a few minutes to make sure the proverbial ship isn’t sinking. For December, my goal has been to create new resolutions for 2012. I sincerely believe that the one resolution per month system has been the most beneficial resolution-making method for me. I was able to achieve — at least in a technical sense — every resolution I set for myself. I have never had this positive of a success rate in previous years. I can look back on 2011 and know I changed myself for the better. With 2012 only weeks away, how are you doing with your 2011 resolutions? I hope you have had as positive of an experience as I have enjoyed. Erin’s 2011 monthly resolutions: January, February, March, April, May, June, July, August, September, October, and November. In our kitchen-themed post of our 2011 Gift Giving Guide, I alluded to the fact that we would be offering a special deal for The Six O’Clock Scramble in mid-December. The time has arrived, and I am eager to share the details with you. If you’re unfamiliar with The Six O’Clock Scramble, it is a service started eight years ago by the magnificent Aviva Goldfarb. Each week, for a very small fee, she emails subscribers a menu plan, corresponding recipes, and a shopping list. The meals are nutritious, seasonal, budget-friendly, and quick and easy to make. You can also customize meal plans to work with your specific food preferences, intolerances, and allergies. It’s also nice because you don’t waste money at the grocery store on food you’re not going to eat before it expires. Aviva is a master at home cooking, and her service helps subscribers become experts, too. A subscription to The Six O’Clock Scramble helps reduce stress about what to serve every night for dinner and is a perfect gift for anyone on your list who has any anxiety about getting good meals on the table night after night. (It’s also a great gift to ask for yourself if you’re the one wanting to get out of a mealtime rut.) Best of all, to sign up for a subscription, you don’t have to go to a mall or fight any crowds. It makes a wonderful last-minute gift, too, since her website doesn’t close at 9:00 p.m. There are 3 month, 6 month, and 2-year subscriptions available. The discount details: When checking out, use the code UNC11 to get 20 percent off of all subscriptions, gifts, and otherwise. The code will go inactive on December 27, 2011. A huge “thank you,” also, to Aviva for working with us to offer a holiday deal for our Unclutterer readers. If you or someone on your recipient list would benefit from such a useful gift as The Six O’Clock Scramble, consider taking advantage of the 20 percent discount and ordering a subscription. View the complete 2011 Holiday Gift Giving Guide. If you don’t have kids and don’t celebrate Christmas, you’re likely confused by this little guy — this creepy, big eye, pointy nose, weird little guy. Which, is exactly as it should be. You should be confused and scared and in complete agreement with me. 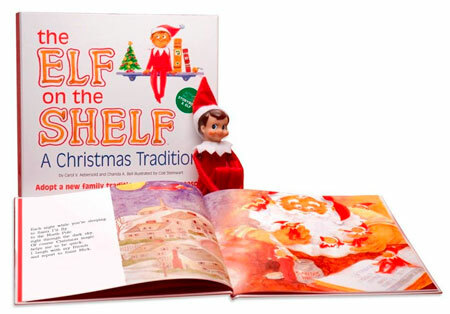 Some background for the uninformed: There is a book you can buy for about $30 that tells the story of the Shelf Elf. In the book, it explains that the Shelf Elf is a spy for Santa Claus. He watches over your family throughout the day, takes scores of mental notes, and then while you sleep he reports back to Santa what happened that day. The next morning, the Shelf Elf is back, but he’s in a different spot in your home. Children are supposed to behave until Christmas out of fear that the Shelf Elf will give Santa a bad report and they’re supposed to want to hunt for the Shelf Elf each morning when they wake. I have so many issues with this. First, how do you know your elf is honest? How do you know he’s reporting accurately what he sees to Santa? I liked it better when there wasn’t a middleman and Santa just assumed everyone was nice. Timmy? Nice. Sally? Nice. Bobby? Also nice. I’ve seen Santa Claus is Comin’ to Town and I know Santa is a generous spirit who is eager to forgive grievances and sounds an awful lot like Mickey Rooney. Second, the elf is a SPY. He’s a spy who repeatedly breaks into your house and you’re so terrified of him and what he’ll tell Santa that you don’t call the cops. When did Santa become a thug who orders elf operatives to break into your home? I’m not okay with this. Santa does not rule some kind of elf underworld. 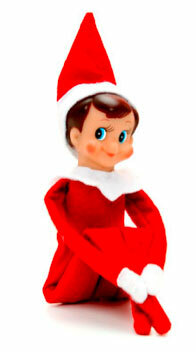 Third, why would anyone eagerly want to hunt for a creep like the Shelf Elf? If I were a kid, I’d flush the eerie thing down the toilet and hope that Santa just thought he took up with some lady elf in Reno. Finally, where’s the motivation for your kid to behave the rest of the year? All this disturbing piece of plastic with beady eyes and freakishly long limbs lacking muscle tone does is instill terror in my kid for most of the month of December. I’d rather my son behave all year round because of a belief in the golden rule, compassion, and empathy, not because of an anxiety-fueled ulcer resulting from a fear of an elf mafia. Except for horrifying children and adults, I’m not sure the Elf on the Shelf has much task at all. Dude, he seriously gives me the willies. P.S. Please don’t take this post too seriously. I’m just having fun. Every year we have written the Unclutterer Gift Giving Guide, we have picked a gift that we believed to be the most generous gift you could give (or ask to receive) to an unclutterer. In 2007, we recommended the Fujitsu ScanSnap (PC and Mac). In 2008, we chose the Kindle. 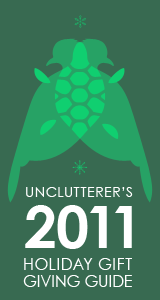 In 2009, it was my book, Unclutter Your Life in One Week. Last year, we went with the Intellishred paper shredder (now called the Powershred). And, this year, we have decided to mix things up a little by thinking outside the box. This is one of those gifts where you have to be careful about how you give it. You have to put out feelers, see if the person is open to the idea of working with a professional organizer. You need to know the person’s personality and gauge whether a gift like this would be welcomed or deemed offensive. Then, you have to make sure the gift is given in a way that expresses you don’t believe the person to be a slob, rather that you know it is something the person wants and will really enjoy. If done correctly, this will be a wonderful gift for someone who is interested in becoming an unclutterer or even just improving one rough area in an otherwise well-organized space. The best way to give one session or more with a professional organizer is to provide a coupon to the recipient with either a designated dollar amount or number of sessions you wish to supply. Also, it can be nice to include a list of three professional organizers who live near the gift recipient as well as their contact information. Professional organizers specialize in particular areas, so be sure to suggest an organizer that matches with your recipient’s needs. The best and easiest way to find a professional organizer who lives near the gift recipient is to go to the National Association of Professional Organizers’ website (http://napo.net). There is a “find a professional organizer” tool that allows you to search for organizers by zip code. I recommend choosing a radius of “within 50 miles” to get a nice selection of organizers to research. Once you’ve narrowed the field to three organizers to recommend, it is best for the gift recipient to make the final decision about who will be the chosen professional organizer. Feeling comfortable with a professional organizer is very important to the success of the sessions. If your gift recipient doesn’t trust the organizer in his or her home or office, or respect the organizer’s skills, your money will be wasted. And, it should go without saying, but none of the organizers I just listed paid me or rewarded me in any way for including their names on this list. They’re simply people I’ve grown to know over the years through NAPO activities and whose work I am acquainted with in some form. In chapter eight of the tale “It’s My Own Invention,” Alice encounters the White Knight, a man with a nasty manifestation of Just-in Case syndrome. Introducing the new internal Unclutterer store. 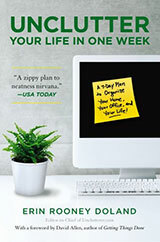 Available are two t-shirts: “Simplicity is revolutionary” and “Less is more.” Also available are the seven worksheet PDFs that accompany the book Unclutter Your Life in One Week. Why should I safely curl my eyelashes in front of a mirror when I could do it blindly in front of my laptop with 5V current? The Munchler is a lunch bag that can also be carried like a backpack. It also unzips into a place-mat for easy use. Made from polypropylene, it will insulate your child’s food. If you’re going to buy something tangible, we suggest getting gifts that work with our motto: A place for everything, and everything in its place.